“If a survivor comes to your church there needs to be an open-handed welcome, because the church is the only place that can meet all of a survivor’s needs …that can give spiritual support.” So spoke a participant at last week’s consultation on human trafficking – a participant who was herself a survivor, trafficked from East Asia to the Middle East and then Europe. This was the question before the Anglican Alliance meeting in Cambodia last week – how can churches work together and with others to prevent human trafficking and support survivors as they seek to rebuild their lives? 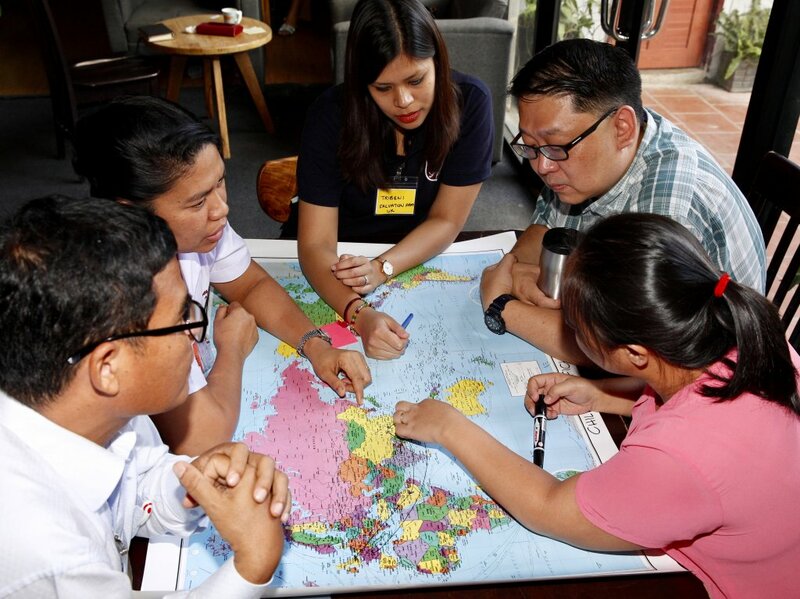 From 1-5 October, the Anglican Alliance and the Salvation Army brought together a group from churches in East Asia for a workshop on human trafficking and safe migration. 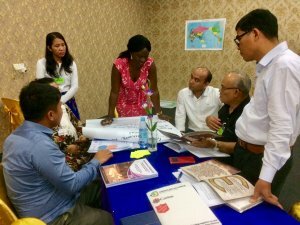 35 participants gathered in the capital of Cambodia, Phnom Penh, to share their experiences working on human trafficking and to gain insights from the innovative work of local agencies, including Christian organisations. Human trafficking is a global problem. The issue has been raised as a priority in all of the Anglican Alliance regional consultations around the Communion. 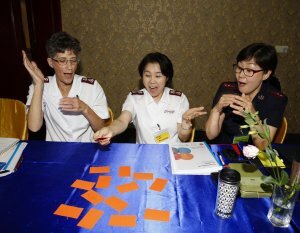 This workshop, convened jointly by the Anglican Alliance and the Salvation Army, involved practitioners, both clergy and lay people, from across the East Asia region. Annam Arunanagayam, Anglican Alliance regional facilitator, had liaised with the Provinces in East Asia – within the Council of Church of East Asia – to identify delegates already working on issues of human trafficking and safe migration. The group also included those with complementary skills, such as lawyers, community development specialists and researchers. 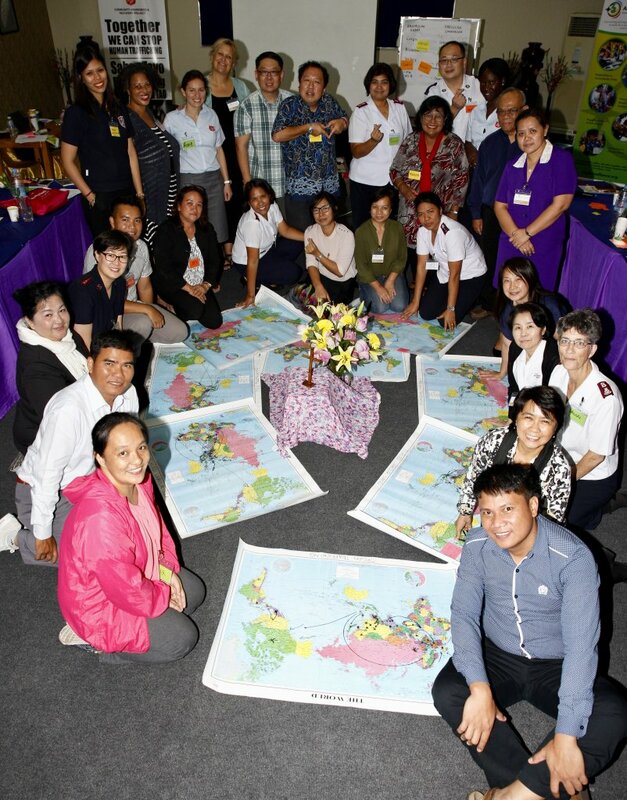 The consultation was joined by representatives from Caritas, the Mission to Seafarers and the ACT Alliance, organisations which connect with the Anglican Alliance on issues of human trafficking and migration. Anglican participants came from churches in Myanmar, West Malaysia, Sarawak, Philippines, Cambodia, Thailand and Japan. The purpose of the workshop was to share insights and expertise, create connections and build a community of practitioners across churches in East Asia to tackle human trafficking. 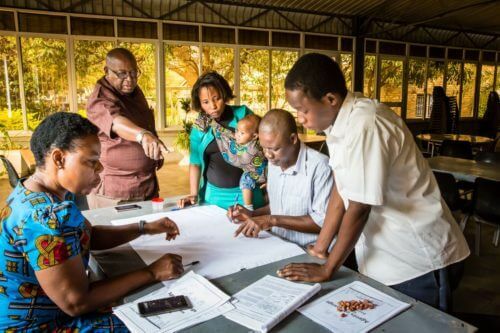 The focus was on designing a strategic response for church interventions, an approach which builds on their own skills and assets, while partnering with others. For each aspect of trafficking, the group developed action frameworks – how churches can respond at local, national and regional levels and partner with others. The group also discussed the vital importance of research to underpin these interventions with evidence. A session on research – and how churches can themselves engage in research – was led by Christa Crawford, a research specialist on human trafficking from Thailand. As Christa said: “What is the point of doing any of the Ps if they don’t work? We are accountable to God to be good stewards – and we are wasting time and resources, and not serving the people God wants us to, if we aren’t doing things that actually work.” Christa suggested adding an eighth P – Proof. This commitment to research was underlined by a special session where the participants joined the global Joint Learning Initiative Learning Hub on Human Trafficking. This learning hub brings together academics and practitioners around the world to share their research on how local faith communities are tackling human trafficking. The hub is currently undertaking a scoping study to analyse existing data. This study is funded by the Anglican Alliance. The consultation also heard from Canon Andrew Khoo, a lawyer and Chancellor of the Province of South East Asia. Canon Andrew outlined the importance of knowing the law and regulations in one’s own country that can be used to protect and support people caught up in human trafficking. He highlighted the regional and global inter-governmental initiatives to tackle this issue and discussed how churches can engage at policy level. One day was spent with the anti-trafficking organisation, Chab Dai, which leads a coalition of NGOs, many Christian, working to end human trafficking in Cambodia and the region. Chab Dai staff talked about the dynamics of human trafficking in East Asia and shared their research findings. One significant finding was the need for long term care for survivors to be based in the community not in shelters. Short term care in shelters has value in the immediate recovery phase, but, in the longer term, survivors need on-going and long lasting accompaniment and support in communities to regain their lives and livelihoods. This, said Chab Dai staff, was a key role for local churches. The workshop sessions began each day with Bible study and prayer. The group considered the model of accompaniment which Jesus gives in the story of his encounter with two disciples on the Road to Emmaus (Luke 23: 13-35). They also looked at Jesus’ approach to meeting community needs in the story of the Feeding of the Five Thousand (Mark 6: 30-43). Rather than just provide food, Jesus first asked what the people already had – and so mobilised the assets of the community – the loaves and fish. On the final day the group read the passage about being Salt and Light in the world (Matthew 5: 13-16) and considered what this meant for their own work bringing light and healing to the issue of human trafficking. The devotions on the fourth day – a reading from Isaiah 6: 1-13 (“How long, O Lord?) – responded to the participants’ own emotions, as the cumulative impact of studying this issue was experienced. Some came from sending countries, others from receiving countries. The participants talked about the importance for self-care when working on such difficult issues, having time to abide with God and place these painful concerns in God’s hands. Revd Rachel Carnegie, Anglican Alliance Executive Director, co-facilitated the consultation, bringing perspectives and learning from other parts of the Communion. Rachel shared how human trafficking is a major focus for the Anglican Alliance, identified in every part of the Communion. The Alliance’s role is to encourage churches to engage, share skills and models of response and promote a Communion-wide movement to learn, pray and act. The Alliance works in an ecumenical partnership with the Salvation Army and Caritas Internationalis. On the Alliance’s website, Freedom Sunday materials provide information, prayers and Bible studies. The website also showcases examples around the Communion and has a campaign: the Freedom Years, leading to Lambeth Conference 2020. The Anglican Alliance’s work on human trafficking is generously supported by the Clewer Sisters, whose community’s ministry was founded on the care of vulnerable women and girls.